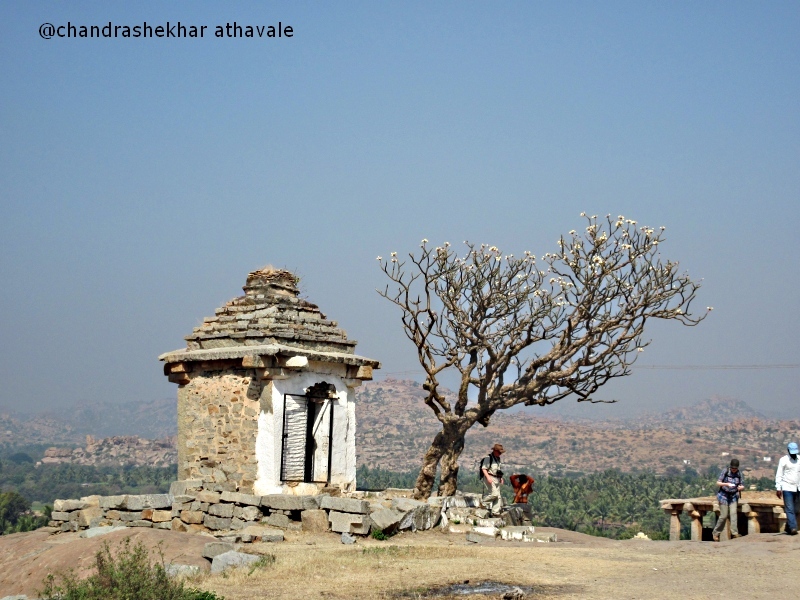 The Sasivekalu Ganesha temple in Hampi, which I just visited, is located at the foot of a small hillock known as “Hemakut Giri.” This hillock looks rather tiny, however climbing up from the side of this temple is difficult because the cliff here is rather stiff. Most of the people take the diversionary route, which goes around the hill, because it is easier on your legs. I decide to take this longer route and start walking. Ahead of me appears another structure constructed with a granite stone block plinth, pillars and slabs for roof, and that is all that has remained there now. 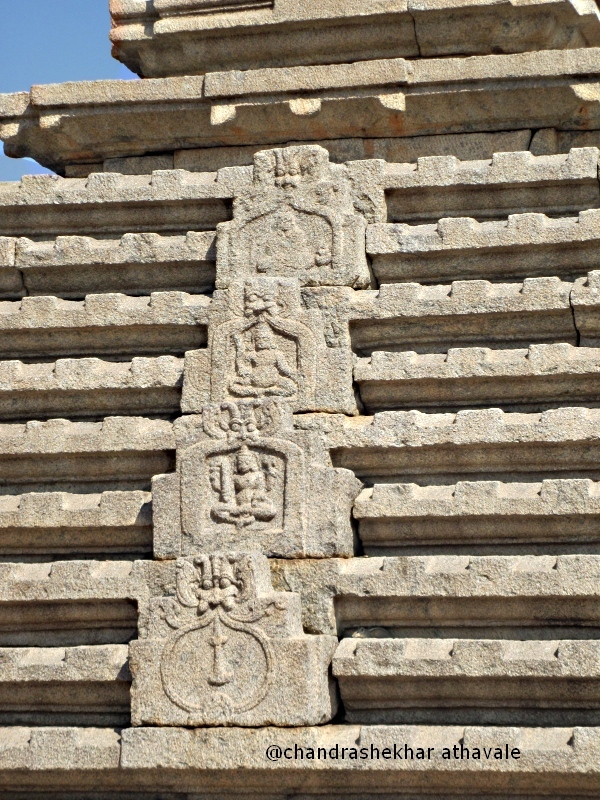 This structure was actually a gate with three separate entrances. Left entrance for the king, right entrance for the senior officers and the middle one for common people. All the three ways converge into the same path later. I am bit amazed at this segregation of classes. I walk ahead and see another Temple structure with another Ganesha idol facing me. This temple structure is somewhat different from the one I saw earlier. There are actually two sections an outside prayer hall, known as “Rang Mandir” and the inside sanctum where the idol is kept. All the pillars that support the prayer hall have bass reliefs carved on them. My initial reaction about the bass reliefs is that they lack fine work. However I soon realize that they are looking bit crude because the basic material in which they are carved is granite, which is an extremely hard stone. 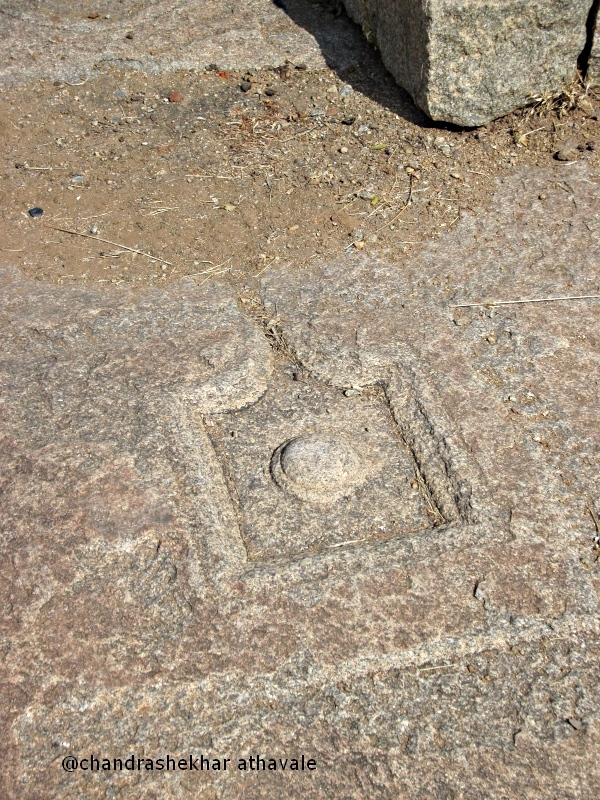 Because of the hardness, it must have been really tough to sculpture or create baas reliefs here. On closer look I much impressed with the bass reliefs as these are quite different from the usual stuff. 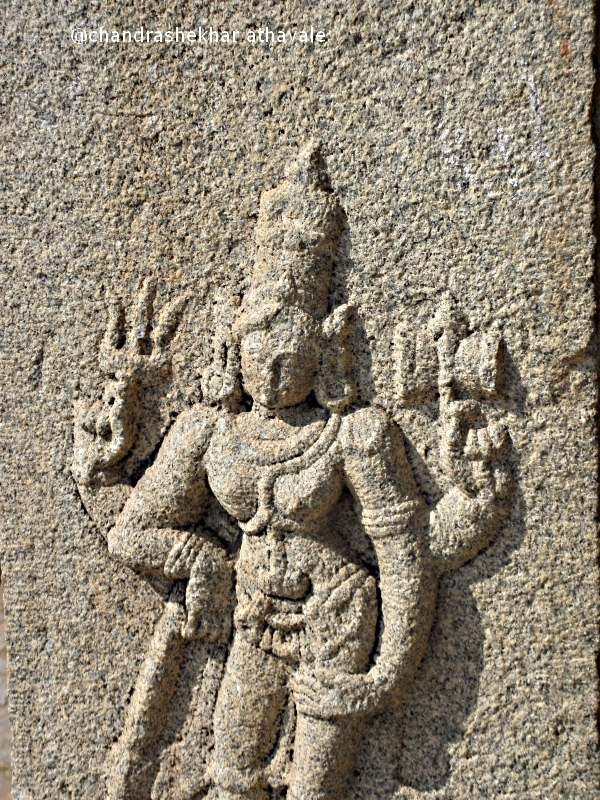 I can make out unusual stuff here like a hunter female with a bow and arrow, a monkey faced lion, a Shiva figure and a lingam and Hanuman monkey with his tail wrapped up around him. 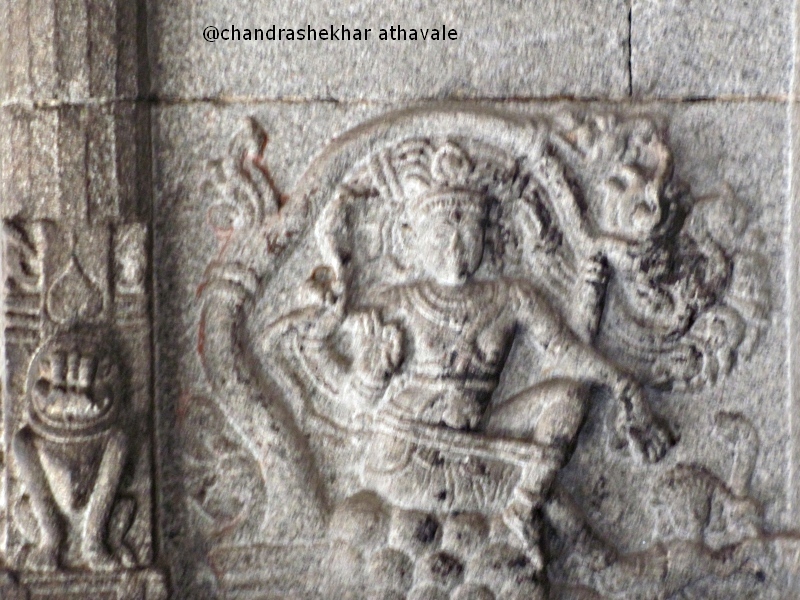 Bass relief on a pillar, a servant with a "Chauri"
The Ganesha idol in the sanctum is huge, at least 15 feet high. The part of the elephant trunk and stomach have broken off and are not seen anywhere. 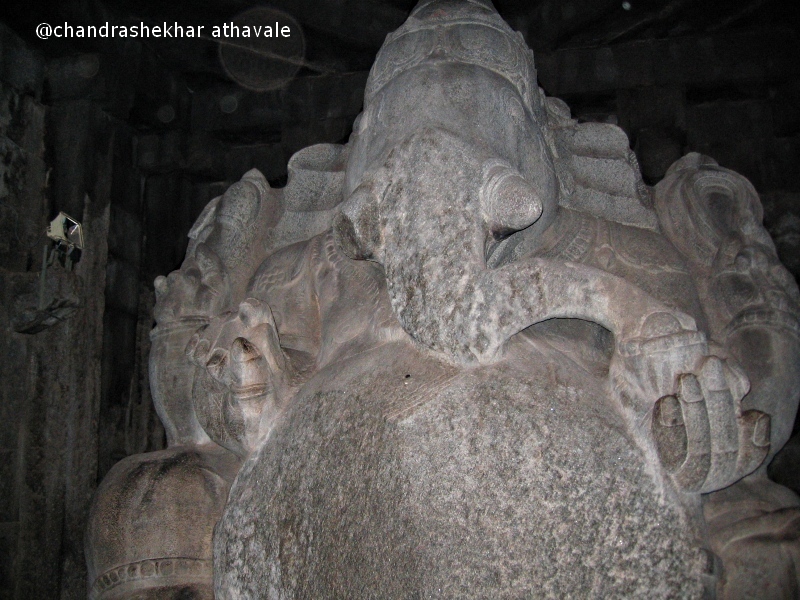 This Ganesha idol was known as “ Kadalekalu Ganesha” because, Kadalekalu means gram lentil in local Kannada language and that is how the tummy of this idol had looked like. The surrounding view from the prayer hall is magnificent . 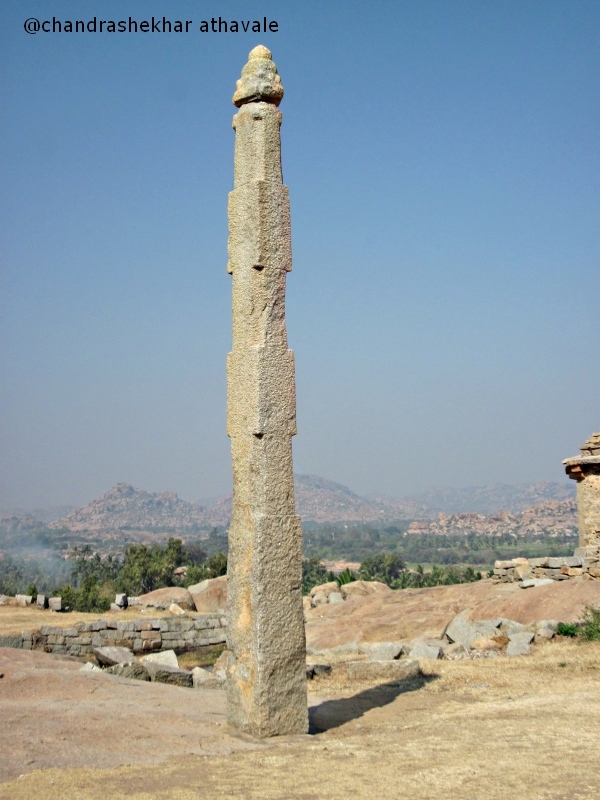 I can see Hampi market directly ahead with famous “Virupaksha” temple on left and further away in almost all directions the famed Hampi's rock mountains. I feel rather pleased with the view and the place. I continue walking on a steadily climbing path and see ahead a huge gate, which has been fashioned more like a Roman or a Greek sculpture without any “Gopura” or tower on top. 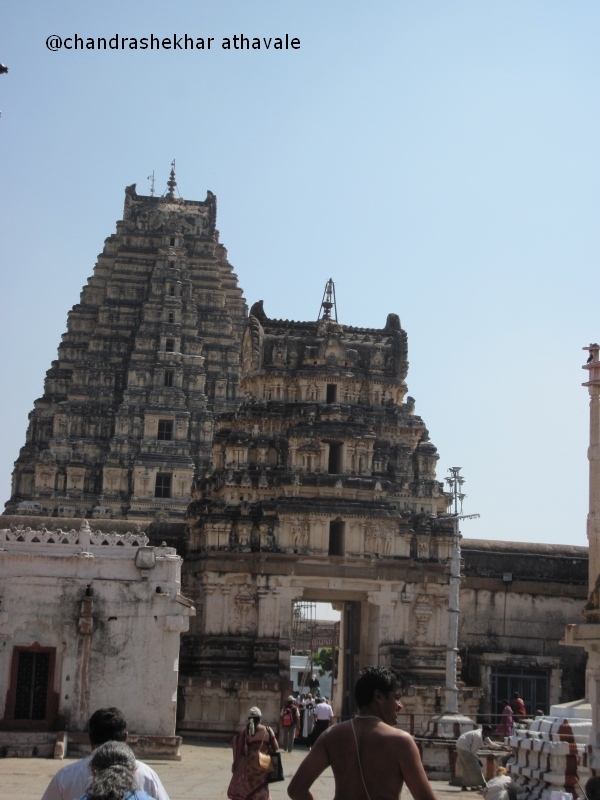 It is also possible that it looks like this because the original Gopura or the tower on the top of the building has now collapsed. There is a particular symbol which I do not understand, but must have been some kind of good luck sign. 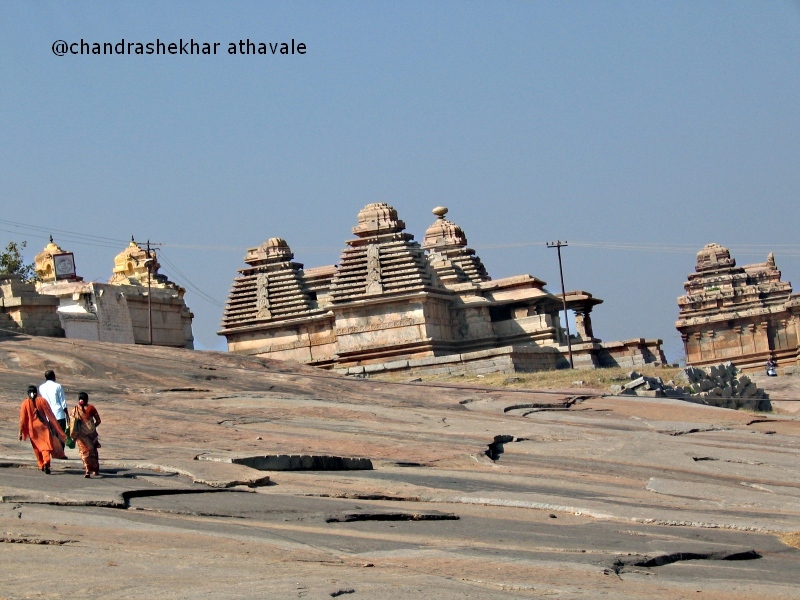 Temples on Hillside; on left are Hoyasala style, middle are Rashtrakuta style and on right Chalukya style. 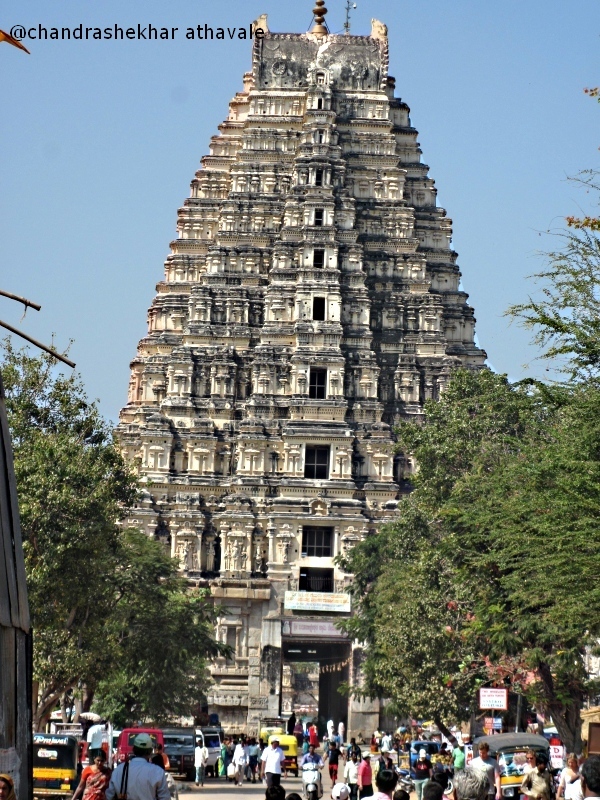 East side View; tower of Virupaksha temple. “Hemakut Giri” means a mountain of gold. This name has been derived from the Sanskrit word “Hema” which means gold. It is believed that when Hindu God Shiva got married with Goddess “Pampa,” this hill was covered with gold flakes, which fell from the heavens. In reality, I can only see shining black granite rock slabs covering almost entire hill. 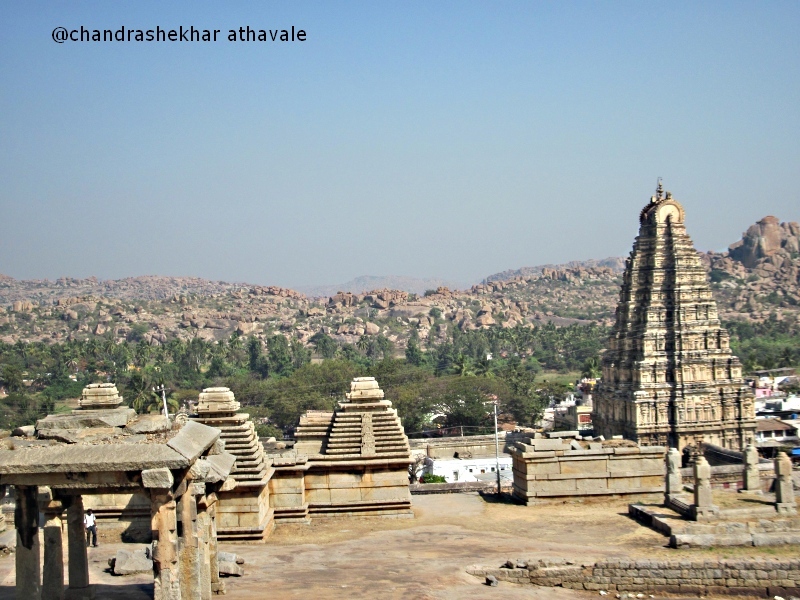 There are number of Shiva temples on the hill with three distinct types of “Gopura” or towers on top. 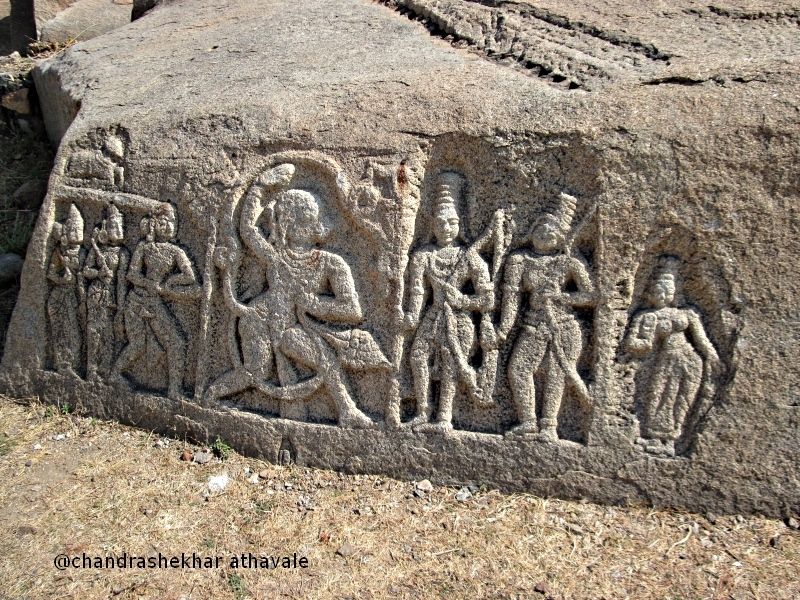 I can clearly identify the typical “Rashtrakut” style stepped towers of earlier times. Perhaps the absence of the tower on the entry gate, which I mentioned above is because of this reason only. 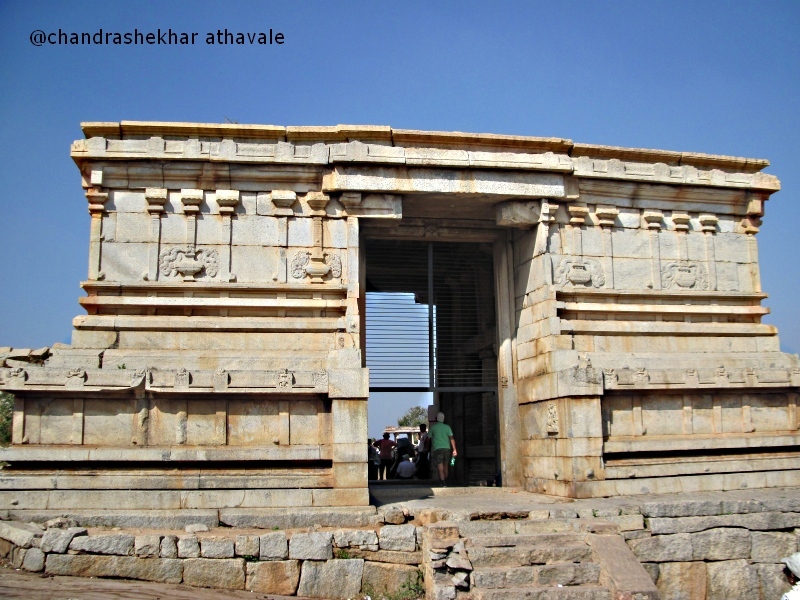 This kind of entry gate without a tower, is seen in many structures of “Rashtrakut” period, like the Gate structure of the famous “Kailash” rock temple at Ellora caves. 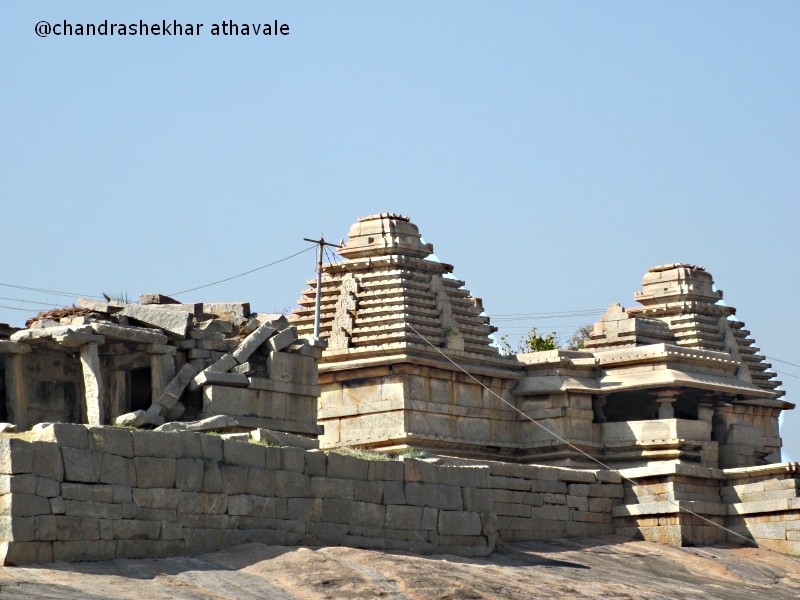 Obviously, many temples here must have been in existence long before the “Vijayanagara” was established. I climb to the top of the hill. I am told that the sunset view from here is quite picturesque. However it is still mid morning here and only things I see are the Sasivekalu Ganesha temple and the Krishna temple further away. There is two storied structure here right on top of hill. I had never seen anywhere this kind of structure built out of just stone slabs without any binding materials. This was built as a place for overnight stay of disciples, who came to prey at the “Hemakut” temples. There were ramparts all around the hill to protect the temples from any invaders. The ruins are still seen at few places. 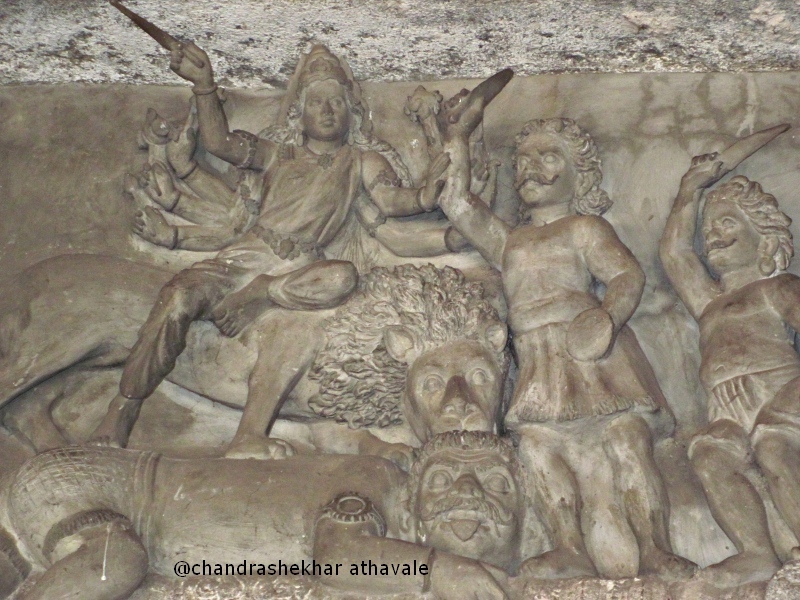 While getting down the hill, I see a bass relief depicting few scenes from “Ramayana” done by some amateur artist. 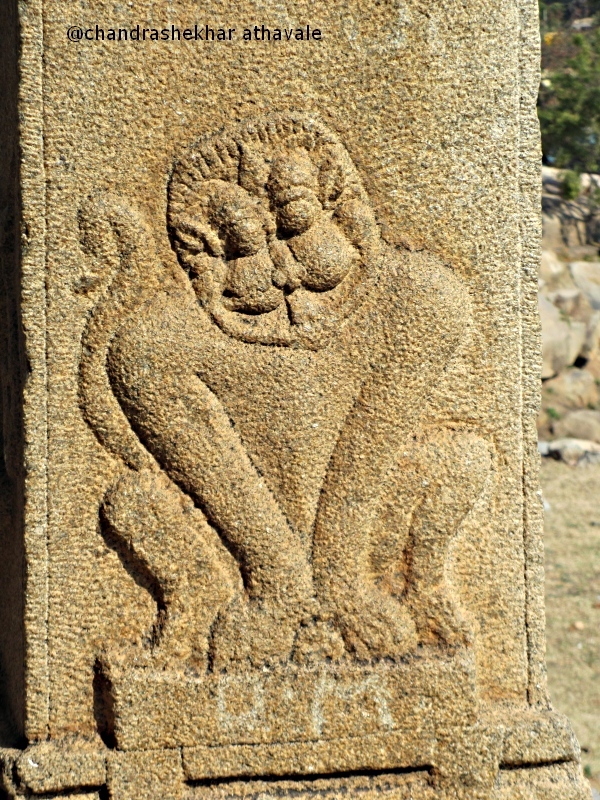 One of the temples has a victory pillar. A Frangipani tree is in full bloom with brilliant white flowers. I just can not avoid the temptation of snapping all that. 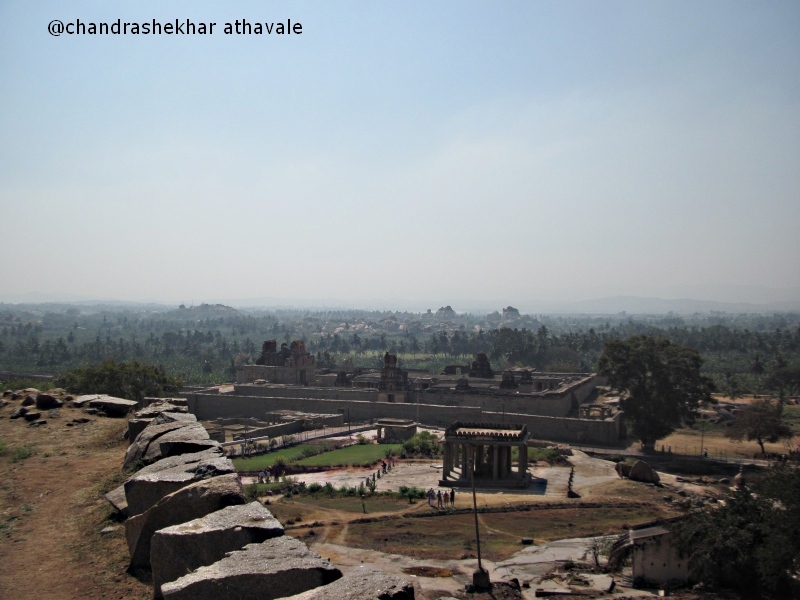 If you look east from top of the “Hemakut” hill, a huge “Gopura” or a monumental tower, can be easily seen at a distance. This tower belongs to the “Virupaksha” temple, which has the distinction of being the only Hindu temple in this place where religious ceremonies or “Pooja” is still conducted and many disciples visit the temple to pay their respects to the lord. I am now inside the temple courtyard having crossed the outer gate over which the huge tower has been erected. I see two huge enclosures on my both sides. 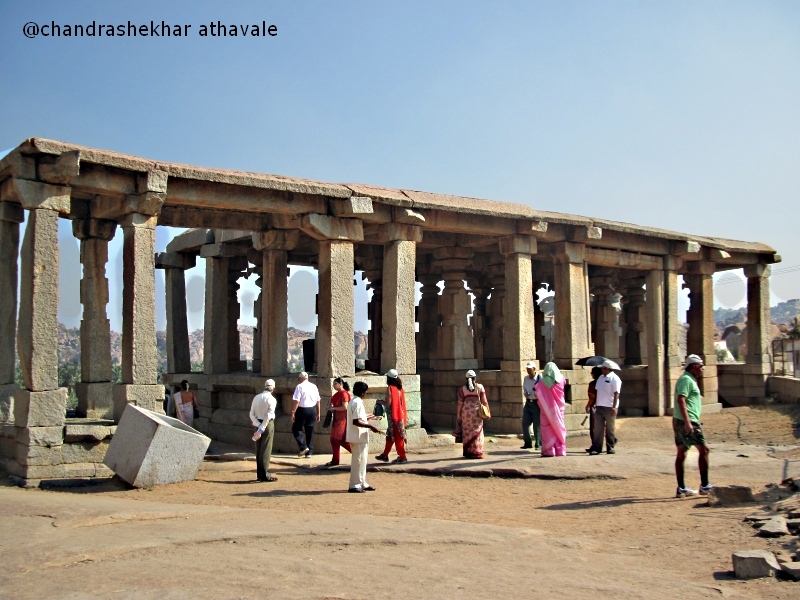 The stone slab roofs of which are being supported by 80 or 100 pillars. 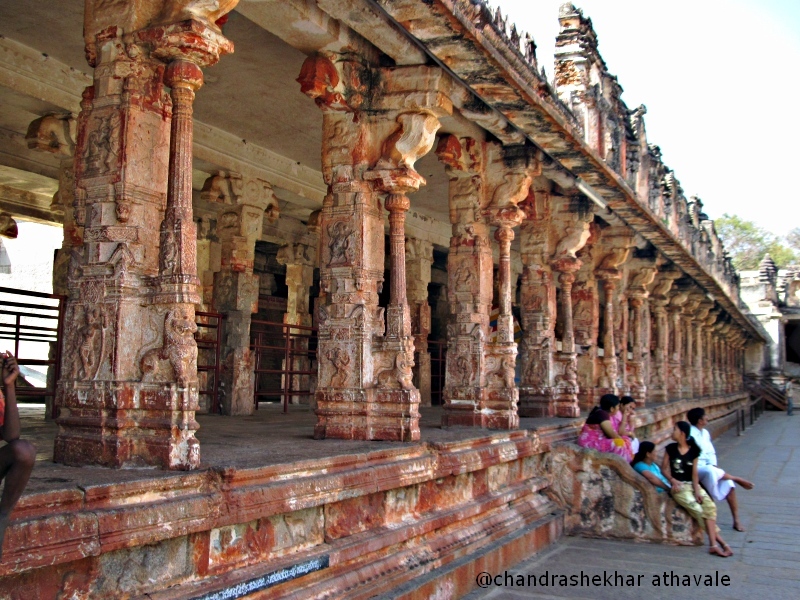 All the pillars and the stone walls are decorated with beautiful bass reliefs. 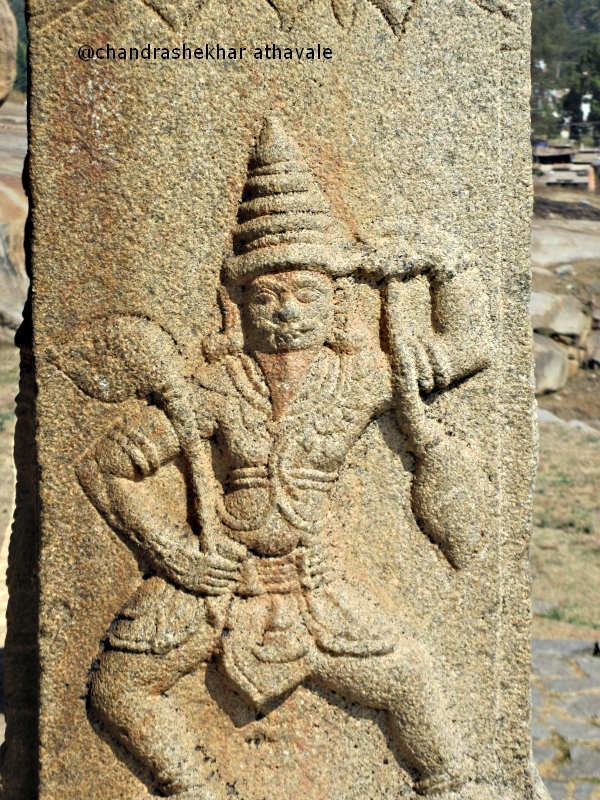 The original “Virupaksha temple” was constucted in the seventh century CE. 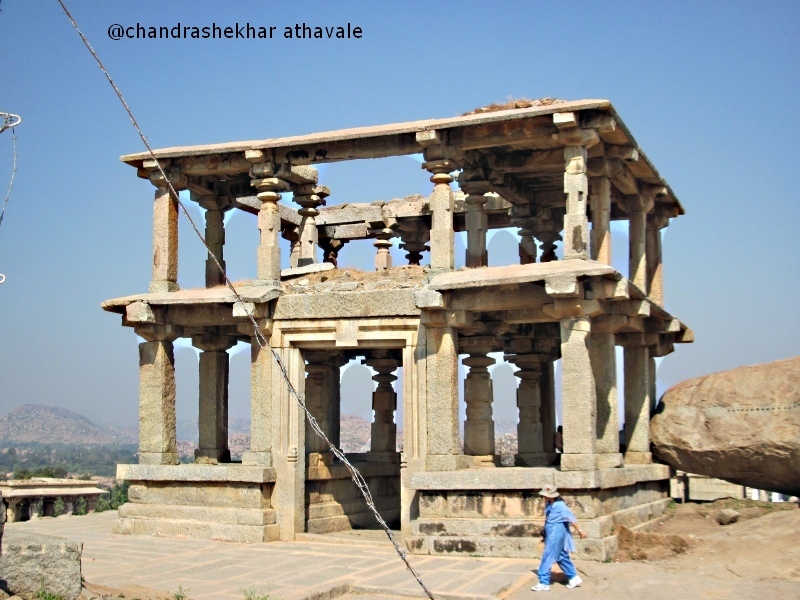 The outside entrance gate and the tower above were built by the Hampi Kind “Krishnadevaraya” in the fifteenth century . There is another gate with a smaller “Gopura.” ahead. After crossing the second gate, I can see the main temple and many other smaller temples on the sides. 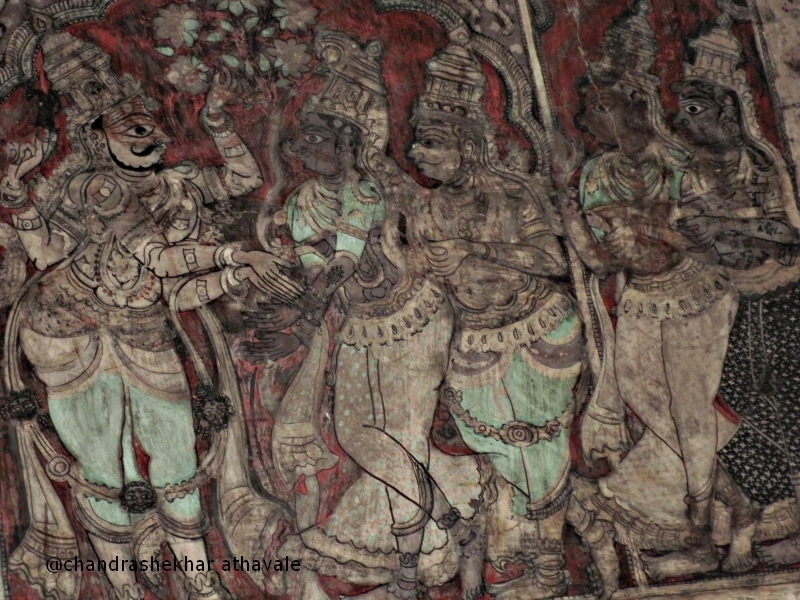 The prayer hall ceiling has some painted scenes from epic “Ramayana” besides few more bass reliefs and sculptures. I do not find anything outstanding in the artwork. There is an exceptional arrangement in a completely darkened side enclosure on the right side of the main temple. 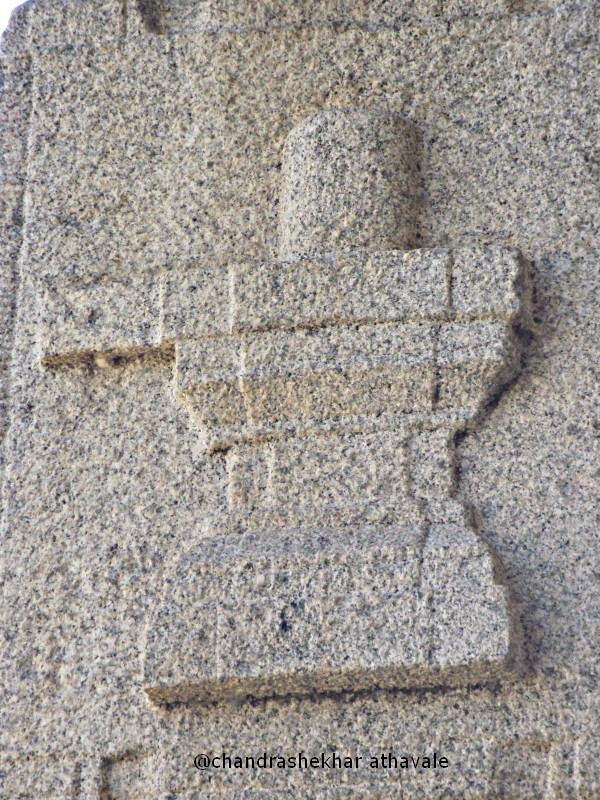 It is possible to see an inverted image of the scene outside on a wall through a pin hole that has been provided on the opposite wall. Am ancient pin hole camera viewer! Obviously, the principle was known to the architects, who built the temple. I find it quite amazing. I walk out of the temple through the south side entry gate. Just outside the temple gate, the way opens in to a wide King's way, which had stalls, where traders used to set shops. All these are now in ruins. Much nearer, modern traders have set up shops here selling materials for religious ceremonies, clothes and usual stuff for visitors like souvenirs and Tee shirts. I find the quality of good quite pathetic and keep walking to our bus, which has been parked a little distance away. 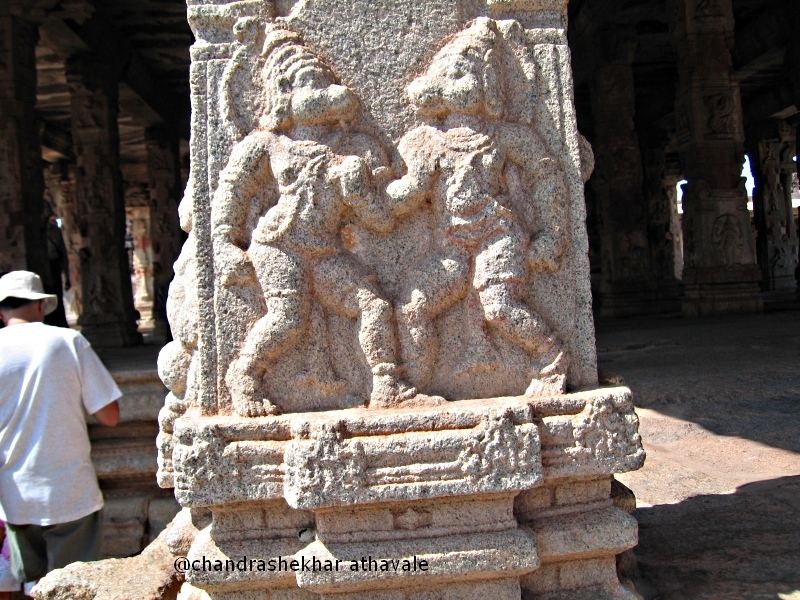 Because of this modern shops, the place is now known as Hampi bazaar.